Standing or sitting (the difference matters, as we shall see) before her work, from a certain distance, one would swear they are looking at a text, possibly a page of a newspaper. 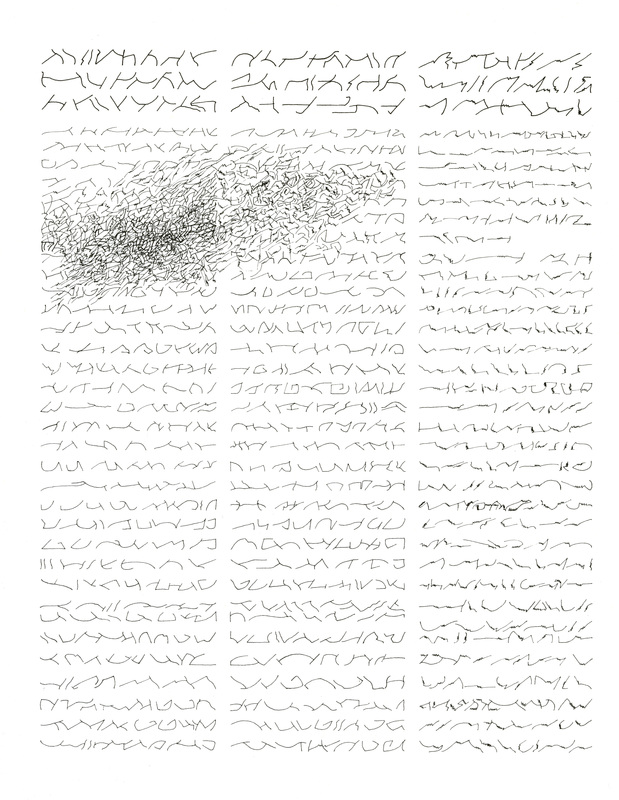 Pay anything like close attention and you see it is neither print nor script, but free strokes, a sort of drawing that imitates a “communication format” and exhaustively limns alphabetic templates. Carefully and incongruously, this tendency toward letterforms leads away from communicable data; “the act of writing,” she claims, is what “provides the unstable dimension. 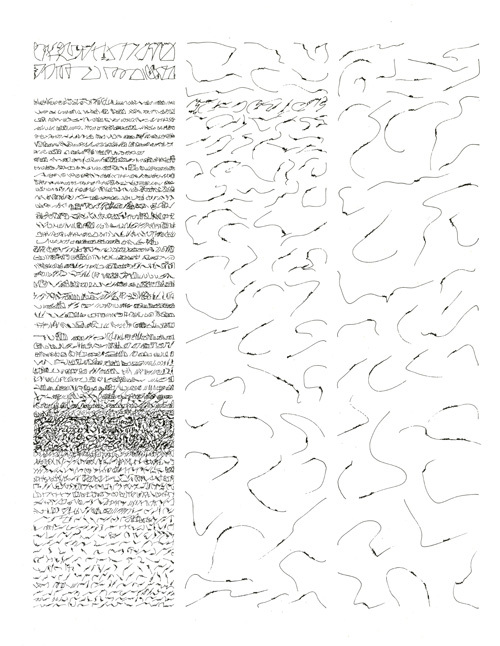 Maybe it’s like saying that for me the liberation of the sign takes place within culture and history, and not on their margins.” Dermisache’s work is, on this point, easily distinguishable from asemic writing that bears surface similarities, like the “stylizations” of Mallarme’s Un Coup de dés by Ernest Fraenkel (which diagram typographic space by a drawing-through method) or the “Martian” texts by Hélène Smith (dictated in seance, forming characters that comprise, on the advice of Saussure himself, an otherwise alien linguistic system, when not lapsing entirely back into French). I wouldn’t call Dermisache neo-Taschist, either. The gestural strokes of Henri Michaux and Andre Masson rely on a sort of hermit’s paradox: when free marks refers to a norm they in impute in turn. The negative capability of the ideogram or hieroglyph wasn’t just a Poundian conceit. Dermisache’s work is a literary practice, or at least it is for the literate, at the center of a reader’s experience, not on the peripheries or “margins.” It’s the historicity of experience that matters. “I started writing…” But how can this be? The effect of a Diario, for example, is to trompe l’oiel (see Martha Wilson's contribution to MOMA's "reading list"). What you perceive to be the raw materials of writing batched into columns and other “documental structures” reveals itself to be illustrative, a stupefying proliferation of pure signifiers. The raw materials of illustration are used as exposition, but what is exposed is rather a place for linguistic reference. Nothing (else) is referred to by it. Her writing is illocutionary: it does the deed. Asemantic writing may be the best term to describe Dermisache’s practice. But can writing without semantic value produce prosodic effects? We think of prosody as specifically organized to hinge speech to meaning. But who knows what this says? Where or how would one read it aloud? How do free marks key into utterance? Though specifically disorganized (it specifies linguistic space), hers is not that species of disorganization called chance—not a figurative rendering of alphabets hitherto known, on analogy with what Deleuze, following Pierce, calls the “diagram” (see my flirtation with this in an earlier commentary). I don’t see these marks as “free” in that way. At most, our gaze implies such figures, enough to have a visual prosody unique to the artist. Another incongruity, then, stems from having made sense of the artist’s labor, and laboring to do so literarily, without reading a word. In March, 1971, Roland Barthes wrote to Dermisache a brief, laudatory description of her “extreme intelligence”—the meaning—of suggesting “the idea” of “writing” in “essence”: “a shape that refers to its own definition.” Not knowing who he was at the time, she then went out and bought a copy of Writing Degree Zero, and read it, which in turn prompted another book of her own. This episode was “an important first, someone called my work writing,” a presumption she’d never questioned before. Being recognized by a stranger is just what writing facilitates. Ask Phaedrus. The left-hand column that appears on the last page is an allusion to those who died at Trelew. That was in 1972. Outside of that massacre, which did have an impact on me, as it did on many others, I never wanted to give my work any political significance. What I did and what I continue to do is to develop graphic ideas with respect to writing -- ideas which, in essence, I believe don't have much to do with political occurrences but do have to do with the structures and forms of language. But at the same time, I never delved deep into this subject on the theoretical level. One could take it to mean that these oppositions aren't theorized, so the political and language aren't wholly separate, after setting an example of this herself. Moreoever, the Trelew Massacre was itself a mimetic, or staged escape in reference to those who survived it. Revenge was taken on escaped prisoners by forcing a remainder who were caught to reenact the attempt, only to be shot in the process. So neither is there “copying out.” Allusion must be a potentiality in any case, but the graphic import of the work cannot derive from a model, however real or familiar. Second, Dermisache considers her detachment and anonymity a determinate factor in the meaning of the work—echoes of the intentional fallacy. In the same interview, she describes herself as characteristically withdrawn, but the work as impersonal by design rather than predisposition. 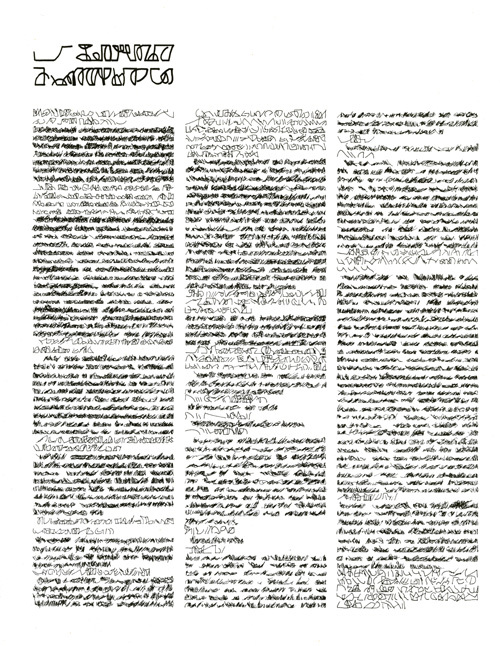 “[A]nyone can read it as well as anyone.” When her work was included in P420’s Alphabets of the Mind show that year, Angela Madesani’s catalog essay attributed the allusive or referential limits of the work to “a profound social and historical awareness” of “a world strongly inclined to offer a solution to everything”—an “anti-dogmatic attitude” that was out of phase with the 1960s and 70s. Madesani describes a group of artists who were taciturn yet aware, making something out of the very instability that only doctrine contradicts. Artists who were their first readers, exemplifying the kind of participatory reading asemic writing requires. In this sense, maybe comparison to conceptual writing is apt, though the methodological distinctions would be obvious. After postmodernism, illegibility is the new indeterminacy. Although her “Libros” are commonly displayed under plexiglass, opened to a spread chosen for us, the work would be compromised by the limitations of a traditional book, with its diacritical apparatus. So, by “writing” I might mean “text” if by text I mean “trace,” the “potentiality” that Agamben emphasizes in his assessment of deconstructive tropes; the “piece” must resemble reference without referring to an object. Any “term” Dermisache has written must “signify itself, but signify itself only insofar as it signifies…it must…above all refer to the ‘standing for’ itself.” And since the distance from which the work is seen has something to do with the degree to which it implies linguistic value, it obviously plays with our typographic expectations as readers. 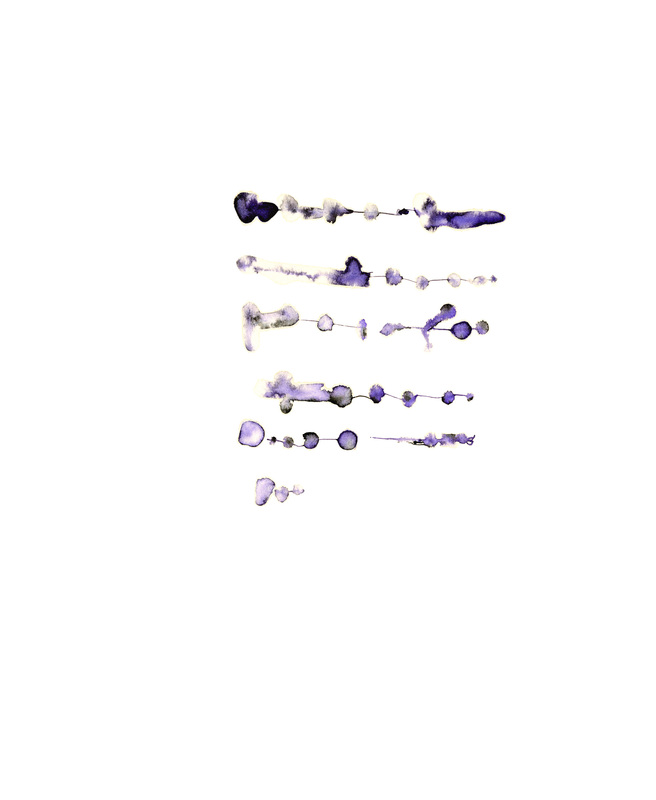 (For me, script is evoked only when I see the ink blur, as in Cinco Textos .) This is just what prosody does; by adjoining the graphic (first) to the phonic (subsequently), the morphemic effect is synonymous with the work, not a result of it. A synonym is just that: a name ensemble. Forgive the clumsy phrase “name ensemble,” but it’s hard to come up with a synonym for synonym without redundancy. Redundancy is precisely what synonymy precludes. Dermisache wrote books, but why are none of these sitting spine out along the chain of post-modern literature in paperback, clogging my library shelves? 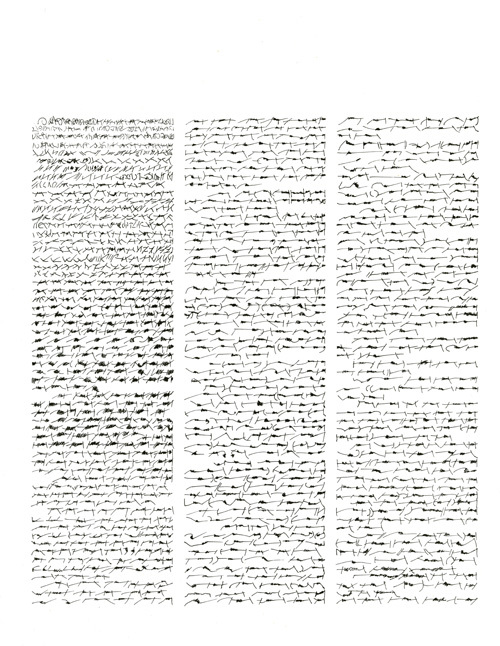 Editor, publisher and curator Florent Fajole collaborated with Dermisache to find a proper platform for her work, which he calls the “dispositif editorial.” As he theorizes it in his essay for a 2008 exhibition, the dispositif functions sometimes to enclose (in the form of an envelope) and sometimes to disclose (in the form of an environment, corresponding to two respective “spaces.” Analogous perhaps to a bibliotheque, which is both archive and reading room, a single space functioning in two opposite ways, one has limited visual utility and the other plainly utilized by the eye. The apparent opposition he then equates to the very dialectic between aesthetics, as a non-utilitarian form of work, and semiotics, as the alignment of the component parts of the sign. According to Fajole, the inscription-object is one thing and the book-object another. The problem for publishing Dermisache’s writing is that objets d’art reproduced in a book (bound) or torn from it (to hang) confuse “le sens et l’usage.” Disentangling sense and use is managed by separating our view of “all semantic compliment (pagination, colophon, etc. ).” The dispositif editorial resembles not a little the curatorial apparatus (placards, catalog, certifications), but departs from exhibition standards. Nothing is hung, and reading is modulated by the space rather than modifying (encroaching on) it. This semantic complement cannot take on morphemic (ideational) value. That you’ll find actually being there, the unique phenomenological experience of, as he put it to me via email, “appropriating” the work. You can recombine pages of an offset edition of the displayed pages and take them home with you, or sit and read with or without company, at one of several tables, upon which the loose pages are stacked. For Fajole, the envelope or installed environment has an autonomous value. The envelope or installation is not to be regarded in itself, but it stores, transports, disseminates, conceals or reveals the writing: publishes it. Its value, he says, is neither graphic nor semantic, but “semiotic.” The dispositif editorial is a non-space, a non-object, a derelict void. It is unserveillable because to see it is to be engulfed by it. You look in, not at. The envelope functions similarly, in reverse. The notion that this amounts to publication rather than exhibition stems from Fajole’s first meeting with Dermisache, when he visited her studio in 2003 with Geneviève Chevalier and the three agreed to collaborate. Fajole unearthed the first published mention of her work, in a Buenos Aires weekly and written by Egardo Cozarinsky, who interviewed the artist. In it he found the “fundamental criteria of [her] art,” foremost that “all her production was created in order to be published. It is not a possibility, it is part of the creative process.” This follows from its status as writing, which is, as he points out, “intersubjective.” He associates this with “an ethical commitment” to close the distance between artist and audience, and to expand the latter. Dermisache is quoted in Cozarinsky’s piece as saying that the work “only makes sense when an individual appropriates it,” and Fajole told me that “during the creative process the first person who appropriates the work is the publisher, in a way the first reader.” The recombinatory and circulatory possibilities of the installation are introduced by Fajole and Chevalier to lessen the “qualitative difference between the possibilities of the body and those of the mind while appropriating the object,” from which I get the sense that its “semiotic” character issues from its function as a conduit. 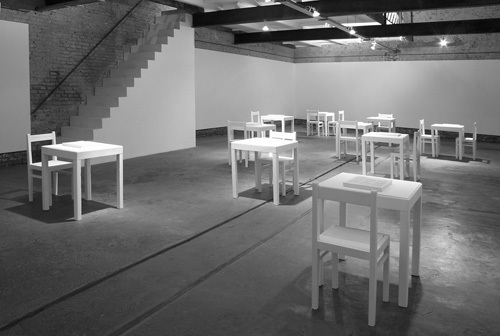 Their first collaboration was the publication of Nueve Newsletters & Un Reportaje at the Espacio de Arte Contemporáneo, El Borde, Buenos Aires; all the images here are of this dispositif editorial (Mirtha Dermisache: Escrituras ] : [ Múltiples, August 3-28, 2004). Note there are ten tables and twelve chairs, “an indication for the public to move them freely” rather than keep their distance from a precious wall hanging. Swerving from the “logic and the system of the unique” that a vertical gallery wall imposes, the art venue is probably necessary nonetheless, to facilitate the very semiotic effect of Dermisache’s writing. 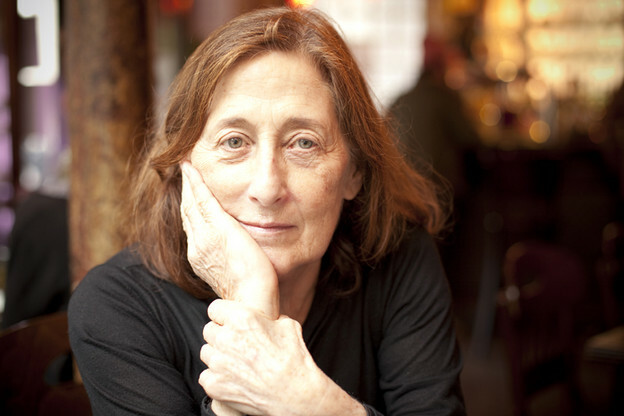 She becomes, to pervert a phrase painted by Ed Ruscha, an artist who writes objects (“ARTISTS WHO DO BOOKS” is Ruscha’s original). The above paragraphs are really a list, not an argument. There’s every reason to believe, or that I believe, Dermisache’s work is writing. But do I still want to claim it has prosodic value? Maybe I don’t think it’s inarguable that written work must be spoken word to pitch someplace between the mark traced on a page and what that mark indicates. I mean that “claim” is the wrong word here. When I first encountered her work, I immediately enjoyed a feeling of relief. This was by way of a cell phone snapshot I received from a friend standing in a gallery. This friend later reported the same (though it was for me virtual) trompe l’oieil effect. What keeps me interested in Dermisache is the exaggerated role of looking involved in listening to the wholly conventional, thus equally preposterous attribution of speech to letterform or format. The inexact science of scansion is overcome by intuition, and intuition understood as exacting draftsmanship. Maybe the quasi-documentary value of the quasi-semantic (not asemic?) stands for the stand-in of a page for a voice, letting writing say nothing. I feel relieved of lyric structures I have inherited and look forward to an inventive, pragmatic (Gronlund’s actual point) line of verse I’ll see once and once only. (Barthes’ point is similar: an essence cannot be exemplary.) This, sounded, must be what John Cage meant by silence.